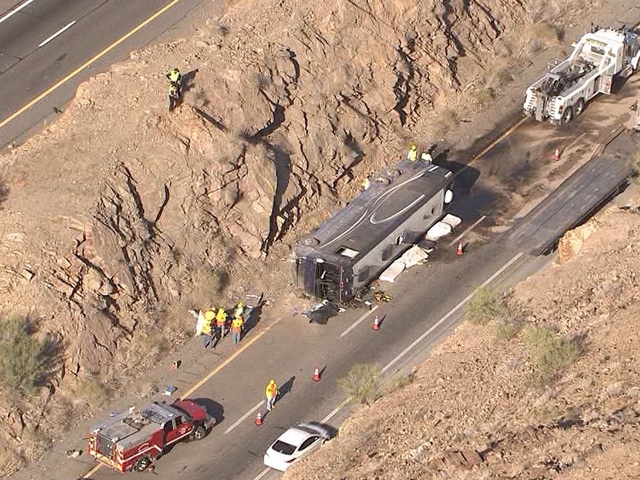 Quartzsite, Arizona—Donna M. Howard, age 55 of Kansas City, Missouri, died from injuries she received when a tire of the bus she was driving failed, causing the bus to roll onto its side and partially ejecting her from the bus. The bus was part of a convoy of drum and bugle corps teams competing in a series of musical performances across the west and midwest, which they named Drums Across the Desert. The Phantom Regiment Drum and Bugle Corps from Rockford, Illinois had just completed a performance in Riverside, California, on Sunday evening. The group was headed to Mesa for the next segment of their tour—a performance Monday evening in Mesa Community College’s football stadium. They had crossed the Arizona-California border on Interstate 10 at about 4:00 a.m. on Monday when the front left tire failed. The bus went over the median, then rolled onto its left side, partially ejecting Ms. Howard, who was pronounced dead at the scene. The bus was carrying 14 people, consisting of support staff. No performers were on the bus. Eight staff members were injured in the accident. Four passengers were taken to Palo Verde Hospital in Blythe, California; two were taken to La Paz Regional Hospital in Parker, and two more were airlifted to Abrazo West Hospital in Phoenix. All eight were treated and released by Monday evening. A rival team, the Academy Drum and Bugle Corps of Tempe, was quick to offer assistance. “Just because we’re wearing a different uniform doesn’t mean we’re not a part of the same family,” an alumnus said. Lauren Ripley, the show co-chairman on the board of directors, said the event’s sponsor, MarchingApparel.com, delivered almost 100 pizzas to the 200-member musical group. The Phantom Regiment chose to not perform Monday night. Phenom SoundSport was added to the event to fill the vacancy. Other bands participating in the multi-state competition include Watchmen, Santa Clara Vanguard and The Academy. The latter two groups will add special encore numbers to their presentations Monday evening. The corps’ next performance is in Chickasha, Oklahoma on Wednesday, before returning to their hometown of Rockford, Illinois on Friday. We extend our condolences to Ms. Howard’s family and friends at this time of great loss, and we wish swift and full recoveries for those who were injured in the tragic accident.